Every year we rate the most and least reliable brands based on service calls. Last year we logged 34,687 service calls up from 31,000+ in 2017. Why Are Electric Ranges So Reliable? Which Electric Range Should You Buy? However, it's not an accurate measure of reliability. Products like refrigerators will fail more than hoods, disposers, and dishwashers. So, a brand selling more French door refrigerators with dispensers, for instance, will be less reliable than another brand selling mostly dishwashers. As a result, we have segmented our reliability article into product categories like pro ranges, dual fuel ranges, wall ovens, dishwashers, front load washers, and induction ranges. 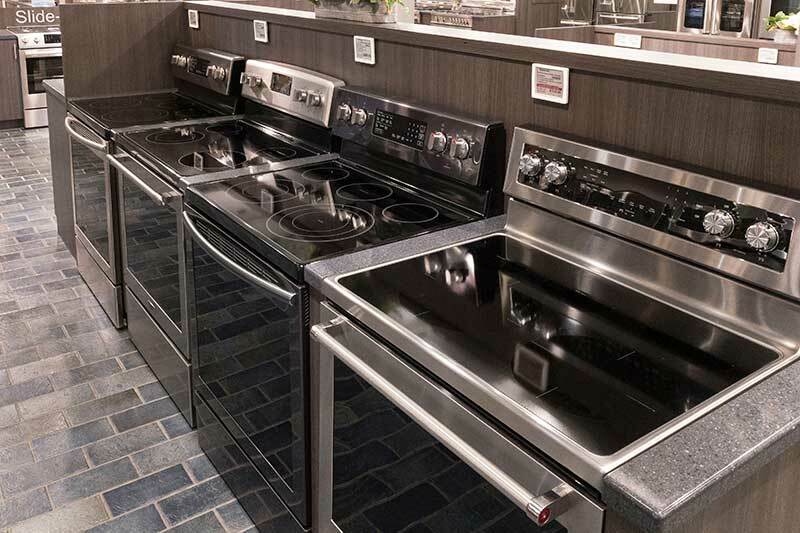 In this article, we are comparing reliability rates for electric freestanding and slide-in ranges, which comprise about 38% of cooking sales. First, let's break down how we measure reliability, seeing as it is a very elusive measurement in our industry. There is no benchmark for initial quality in the appliance business. Most publications like Wirecutter and Consumer Reports test in a lab and report results. You want to see how these products will work on your home based on actual service calls. Every day, we have 30 service technicians performing 8-10 service calls with another 150 or so on Saturday. That amounted to 34,687 service calls logged in 2018. You will see sales in that period and then divided by service calls for the reliability percentage. We do not scrub the data. Every time you have a technician visit, it will count as a service call. Damage and phone resolutions do not count as service calls. The average repair rate for electric ranges is about 7.76% in the first year. Appliances, in general, are about 13.4%. In the chart below, we removed any brands with fewer than 5 ranges shipped in 2018. Electric ranges are more than twice as reliable as gas ranges and over 6% more reliable than appliances in general. The heating elements are under glass, so there is no direct contact and less chance for breakage and repair. You have more direct contact with the burner in gas. The number one repair in a gas range is the burner ignition on top of the range. Most companies also have a long history in manufacturing electric ranges and have since improved. When I started at Yale back in 1986, Many companies, even GE and Whirlpool, did not produce a gas range at that time. Electric ranges are the most reliable appliances when you exclude hoods, disposers, and grills. I am a fan of any reliable product regardless of brand because we have to fix appliances under warranty. Most appliance stores will display every brand and recommend everything because they do not service what they sell. Samsung and Whirlpool are the best for reliability, but some of this volume is builder generated for Whirlpool. In apartment and condo buildings, units are not always immediately occupied, or the customer might not know to call us. What is interesting in these numbers is Samsung's service rate. Their products are not basic, but more feature-laden, yet have a relatively low service percentage. We should dispel a myth about Samsung. Their appliances are not harder to fix, and the parts are easy to order. We receive parts the next day from their warehouse in New Jersey. However, based on comments left on the blog from around the country, Samsung may have limited support in certain areas when there are issues. So you should check if you live out of Massachusetts (88% of you do). Electric Ranges all work better than any other major appliance in your home. However, in a full kitchen of new appliances, your odds of repair are almost 100% within the first year with a refrigerator, dishwasher, hood, stove, and a set of laundry. So, reliability has become a big issue. Most manufacturers do not have service departments anymore to fix problems. As part of your shopping process: Definitely shop price, delivery, and installation. You should now at least inquire about service before you buy. Need more information on Electric cooking? 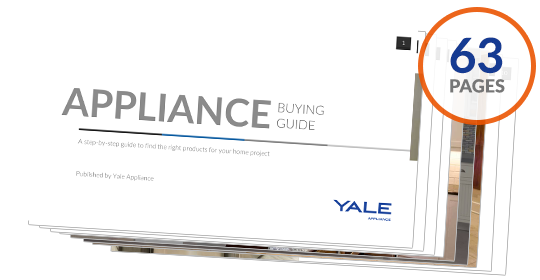 Download the Yale Electric Cooking Buying Guide with specs, features, and detailed profiles to all the brands. Well over 410,000 people have read a Yale Guide.